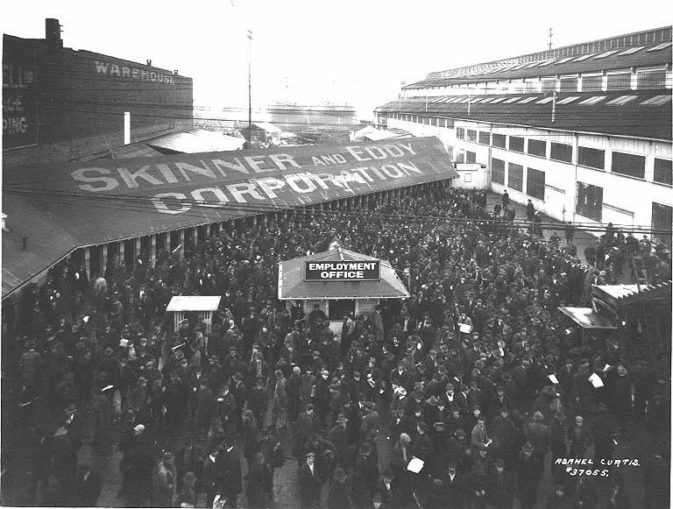 From Feb. 6 to 11, 1919, some 60,000 workers, led by 35,000 shipyard workers, shut down Seattle — population 300,000 — in a general strike. The strike was in solidarity with the Russian Revolution of 1917, which, along with the Chinese Revolution of 1950, was one of the great watershed revolutions of the 20th century. General strikes had already taken place in St. Louis in 1877 and New Orleans in 1892. 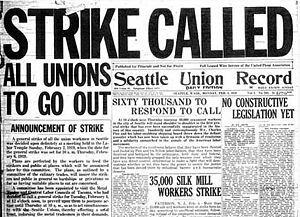 The Seattle general strike was the most organized, with 110 union locals participating. At the height of the industrial revolution, militants and labor radicals founded the Industrial Workers of the World in 1905 to represent all workers, including im/migrant and workers of all nationalities and genders, for industrial unionism and against capitalism. It demanded that workers receive the fruits of their labor. The IWW struck at Lawrence, Mass., in 1912, when thousands of immigrant women garment workers united and fought to victory against poverty wages. The “Wobblies” were involved in big struggles in Grays Harbor County on Washington’s Pacific Coast. They fought a successful free-speech battle there in 1911 and 1912 and overturned a ban on radical speakers in the lumber town of Aberdeen. IWW workers then struck between March and May of 1912 in mills all across Western Washington. Great gains were made against low wages. Thousands joined the IWW during and after this struggle. In 1916, in the mill town of Everett near Seattle, several thousand shingle weavers held out against the shingle mills in a beleaguered five-month strike. The IWW came to the their aid by holding free-speech street meetings in the face of arrests and other heavy repression. On Nov. 5, 1916, two solidarity ships full of bold and courageous IWW workers sailed from Seattle to Everett. Just before the ship Verona arrived at the Everett dock, shots rang out from two covered piers full of the bosses’ armed thugs. Eleven IWW workers were murdered and 31 wounded. Everett was the most bloody confrontation with striking workers in the Northwest. But all IWW mass organizing was met with mass jailings, beatings and defamation of workers in the bosses’ news media — which only stiffened the workers’ determination. Admiration for the great solidarity of the worker-martyrs at Everett helped lead to the Seattle General Strike. In 1917, 50,000 loggers in the Northwest went on strike for the 8-hour day and to win bedding in bunkhouses in lumber camps. The loggers, who were called bindlestiffs because they carried their bedding on their backs in bindles, worked in hazardous and unsanitary conditions. The army was called out against them. Seattle shipyard workers, under very regimented, dangerous conditions, had built 26 percent of the U.S. World War I fleet. But they were under a wage freeze during World War I. The Shipbuilding Labor Adjustment Board in Washington, D.C., had control over wages. It was called the Macy Board after its director, V. Everit Macy. The shipyard workers’ main grievance was their low wages — only $4.16 a day — which were kept low by the rulings of the Macy Board for the benefit of the yard bosses. But prices began going up and, with many workers moving into the crowded city for jobs in the shipyards, the landlords jacked up the rents. Workers in Seattle closely followed world events affecting their class. There were at least 52 working class/radical newspapers in Washington state between 1898 and 1920. Seattle had a daily newspaper, the Seattle Union Record, which bent toward socialism and was the mouthpiece of organized labor under the Seattle Central Labor Council. 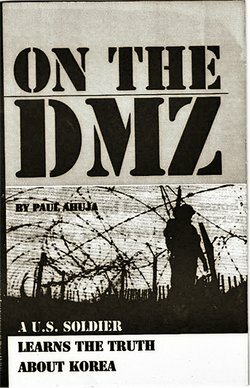 It had a daily circulation of 50,000 to 100,000 during these years. In November 1918, the Seattle shipyard workers, under the Metal Trades Council, reacted quickly to the end of the WWI strike ban and ratified a strike vote. There were 35,000 workers in the Seattle yards, in about 20 union locals under the MTC. On Jan. 16, 1919, the workers’ MTC entered negotiations with the yard bosses for long-overdue wage increases, especially for the low-paid laborers. But bargaining broke down after an intercepted telegram from the Emergency Fleet Corporation, which said the yards would get no steel if any pay increases were given. The 35,000 MTC workers struck the shipyards on Jan. 21, with another 15,000 in Tacoma. Now the complete intransigence of the bosses moved the workers in the direction of a general strike. A leaflet showing a worker pushing a capitalist into a coffin showed up across the city and even around the country. It said “Russia Did It” — a spin-off of the slogan “The Yanks Did It” for a WWI Victory Bond drive. The Seattle Central Labor Council was made up of 110 union locals representing 65,000 workers — half of them shipyard workers already on strike. The CLC had strong flanks from the socialists and the IWW. A Jan. 22 meeting of the CLC was packed to the rafters, and the question of the general strike was cheered forward by the workers against any opposition. Favorable general strike votes were taken in the next several days by nearly all union locals. On Feb. 2, a meeting of representatives from all the unions set the general strike date for Feb. 6. A Committee of 15 was chosen to plan the organization of the strike. The immediate issue was how to run a city without capitalist production and distribution — how to provide and manage the necessities of life for the working class. Essential services such as light and power, fire protection, hospitals and food distribution had to be planned. Organized labor had cooperative relations with farmers through the State Grange, a farmers’ association. How about the aims and duration of the strike? This question was taken up in a way by Anna Louise Strong, the editorial page editor of the Seattle Union Record, who wrote that labor not only would shut down industry, but could reopen more and more industries “under its own management.” She also said that workers were starting on a road that leads “no one knows where.” This shocked the daylights out of the bosses. On Feb. 6, at 10 a.m., the general strike began. It was a Seattle and Tacoma general strike, with 20,000 striking in Tacoma. All the streetcars and trucks headed for the barns, and all activity in the city ceased. Some 65,000 union workers struck, but with many sympathetic non-union workers also striking or unable to get to work, there could have been 100,000 staying home. There were also 5,000 to 10,000 striking coal miners in districts east of Seattle. Labor set up 21 cafeterias serving meals for 25 cents to unionists and 35 cents to others. Milk was provided for babies at 35 milk stations. Linen and fuel was delivered to hospitals under the authorization of the General Strike Committee. The Japanese Labor Association, comprising hotel and restaurant workers, struck in sympathy with a labor movement that had never recognized them. The Labor War Veterans Guards, under the General Strike Committee, patrolled the city to prevent any provocations against the strike. But the threat to public safety came from 1,500 troops brought in from nearby Camp Lewis, who set up machine gun nests at intersections. Instead of urging workers to stay home, it would have been powerful for the General Strike Committee to call out the masses of labor in demonstrations. The great strike lasted five working days until Tuesday, Feb. 11, at noon. The workers had won nothing from the federal government, but were satisfied they had shown solidarity. It was a great demonstration of the growing power of labor against the bosses, who were rabid in their attacks. It was a demonstration of labor’s ability to run and manage society, and also a show of solidarity with the Russian Revolution, as it grew to become a Union of Soviet Socialist Republics. In October 1919 a shipment of crates labelled “sewing machines” came to the Seattle port. Suspicious longshore workers “accidentally” dropped a crate on the dock. Out came rifles from Remington Arms bound for counterrevolutionary Admiral Alexander Kolchak, who led the White Movement against the Russian Revolution. The longshore workers refused to load the cargo, and the Central Labor Council backed them up. Such was the spirit of proletarian internationalism in Seattle and among the working class in many places during and after the Russian Revolution. Seattle Mayor Ole Hanson was whipped into a rage against the Reds, and even toured the country giving speeches on Americanism versus Bolshevism. Possibly influenced by Seattle’s strike, a six-week general strike broke out in Winnipeg, Canada, from May Day, May 1, until mid-June. This general strike involved 30,000 workers — virtually the entire working class of Winnipeg. Sympathy strikes were called in Calgary, Edmonton, Vancouver and all across Canada, and the ruling class was so shaken that they responded with bloody violence. The Seattle general strike and all the organizing during that period helped labor move to a higher level during the 1930s. Under the labor movement, the pension leagues and the Washington Pension Union fought for and won a $50 state pension for workers. This helped force the federal government to implement Social Security for retirees and others. Sources: “Revolution in Seattle” by Harvey O’Connor and The Canadian Encyclopedia.